OANDA has knocked off InteractiveBrokers as the most profitable broker for traders in the Q2 US forex broker profitability report. 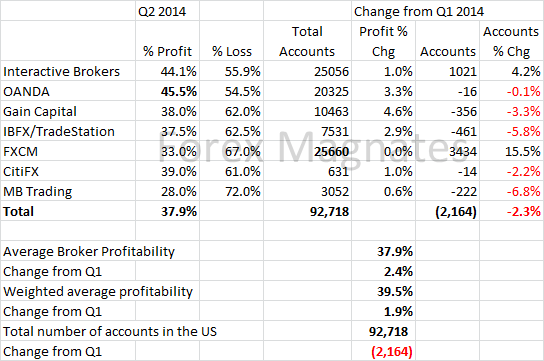 Q2 2014 US retail Forex profitability numbers and active non-discretionary account numbers have been made available to Forex Magnates. During the quarter, weighted profitability of US Forex traders was 39.5%, a 1.9% increase from Q1, a multi-year high for the report. Non-weighted broker average profitability was 37.9%, climbing 2.4% above the previous quarter’s performance. During the quarter, no brokers reported a decline in customer profitability. Leading the way in profitability was OANDA, with 45.5% of its US customers being in the black during Q2. Since Forex Magnates began reporting US profitability figures, OANDA has consistently been among the upper tier of brokers for customer performance. However, results slipped in the second half of 2013. Commenting about their customer performance and general uptick in US profitability, Courtney Gibson, Vice President of Trading at OANDA, stated to Forex Magnates that he believed it was attributable to a number of factors. On the macro level, Gibson stated,”Our clients continue to recover from their short EUR/USD positions (at the end of 2013, the market in general called it wrong, bullish on a Fed taper, and short on EUR which hurt profitability).” On the company level, Gibson stated they they attributed the customer performance on a number of features specific to OANDA such as “near millisecond speed of execution”, educational and risk management tools, and “the addition of strong technical analysis tools from our partners”. Despite the improved performance of traders, total non-discretionary account numbers declined in the US to 92,718. The account figures were 2.3% below Q1’s total of 94,882, showing continued contraction of the US’s retail Forex industry. Account numbers in the US were affected adversely by the exit of ILQ and FXDD, which accounted for 5,550 accounts in Q1 2014. The drop in those accounts was partially mitigated by FXCM’s acquisition of FXDD’s US retail business. However, as seen by FXCM’s 3,434 increase in accounts, a portion of the 4,629 accounts that were reported by FXDD appear to have never made the switch to trading with FXCM. However, incorporating the additional customers from FXDD has allowed FXCM to become the largest Forex broker in the US by active client size, with a total of 25,660 traders. The figure narrowly surpasses Interactive Brokers’ (IB) total of 25,056 accounts, which had held the top stop between Q3 2013 to Q1 2014. Among other individual brokers, GAIN Capital reported the largest increase in customer performance during Q2, as its customer profitability rose 460 basis points to 38.0% from 33.4% in Q1. However, active account numbers shrank by 3.3% to 10,463, and have dropped over 15% from their peak level at the end of Q4 2012, following their purchase of US retail customer accounts from GFT. Elsewhere, the combined IBFX and Tradestation brands are also continuing to see a decline in US accounts. At a total of 7,531 active traders, the figure was 5.8% below Q1, and a 33.1% from Q2 2012 results two years ago. Also shrinking has been the US business at MB Trading, where active accounts declined 6.8% to 3,052 from Q1. However, while their US client numbers have fallen, total global account figures remained steady at MB Trading during Q2.